Leo, Mike and the Cyborg have traveled to Arkansas on the trail of Deathwatch (aka Johnny Lee Raeburn). The android searches a local phone book and discovers that a woman named Agnes Raeburn lives nearby, and the trio heads out to see if she’s Johnny Lee’s mother. Meanwhile, Vanguard and Roxy arrive at a cafe and discover that everyone inside has been drained of their lives by Deathwatch. Roxy investigates the restaurant while Vanguard searches other areas. The alien returns to the grim cafe and reports that every building in the town is filled with corpses. The two head out to find the Turtles. In New York City, Raphael is a one-turtle-army, fighting the mobsters that invaded the Foot’s secret hideout. Raph uses a bow to attack the mafia men and then grabs a submachine gun and mows even more down. Leo, Mike and the Cyborg arrive at the Raeburn home, which looks like a haunted mansion out of a horror movie. The group splits up and the Cyborg soon finds an old woman in a wheelchair who turns out to be dead and “possessed” by Deathwatch. 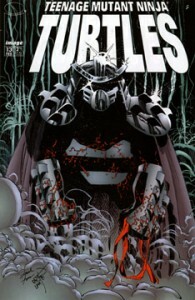 The villain emerges from the corpse of his mother and attacks the Cyborg. The battle in Arkansas rages on, and Deathwatch manages to get the upperhand by grabbing the ‘bot in its tentacles and shooting one of them through its chest. Vanguard suddenly attacks, distracting the fearsome criminal. Deathwatch snares Vanguard in his life-draining tentacles, but we discover that it wasn’t Vanguard at all, but Lurch, the synthetic lifeform that has no brain or emotions for Deathwatch to attack. The real Vanguard arrives and blasts Deathwatch with a huge gun – but the villain managed to teleport away before he was destroyed. Vanguard and Roxy prepare to pursue the murderer, but Mikey halts them, stating that the Cyborg is in bad shape and needs help immediately.